Tracy and Tom Hogan, Springfield Grocery Outlet co-owners, present cash contributions to Tom Mulhern, executive director of Catholic Community Services of Lane County. Shoppers gave $5,000 worth of groceries and $2,000 in cash to the helping organization. 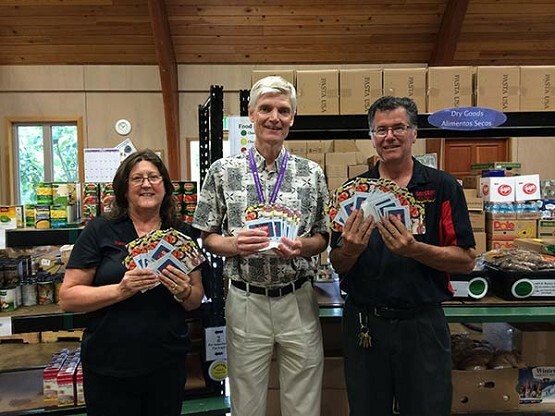 SPRINGFIELD — During their annual “Independence from Hunger Campaign,” the Springfield Grocery Outlet collected more than $5,000 worth of groceries and more than $2,000 in cash that was given to Catholic Community Services’ Springfield Community Service Center. The store was sixth in the nation for results among the national chain of Grocery Outlets, which are independently owned. “This was a wonderful opportunity for Springfield residents to directly help their neighbors in need. We are so grateful for their amazing generosity,” says Tom Mulhern, executive director of Catholic Community Services. Located at 1025 G Street, the CCS Springfield food room is open 9 a.m.-1 p.m. Wednesday, Friday and Saturday. Most food comes from FOOD for Lane County. More than 91 percent of Catholic Community Services clients live below the federal poverty level. “We are so proud to partner with Catholic Community Services of Lane County and to be able to make an impact on our community during an important time of year,” says Tracy Hogan, Grocery Outlet’s co-owner and operator. Catholic Community Services provides food, energy assistance and other resources for those in need and helps Lane County families take positive steps to move out of poverty. Assistance is available to anyone in need, regardless of religion, race, lifestyle or status.